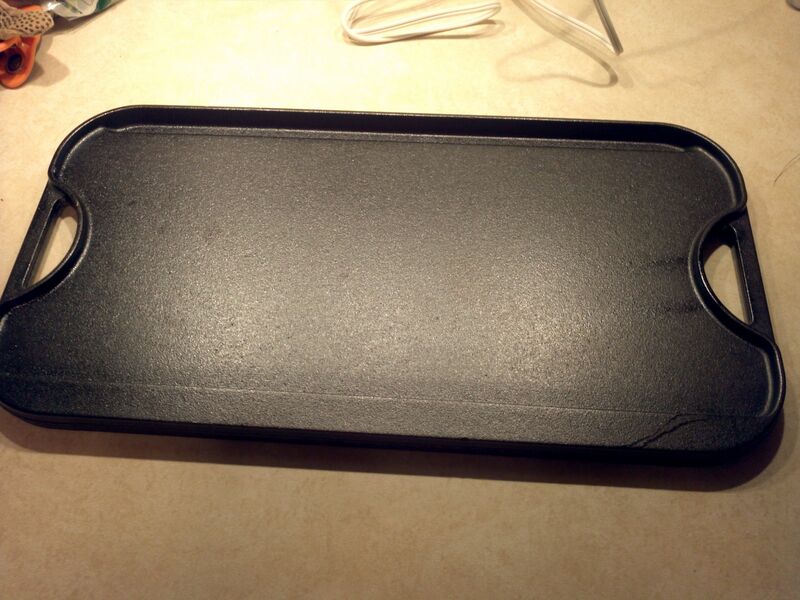 Kitchen Tools: Cast Iron Griddle! 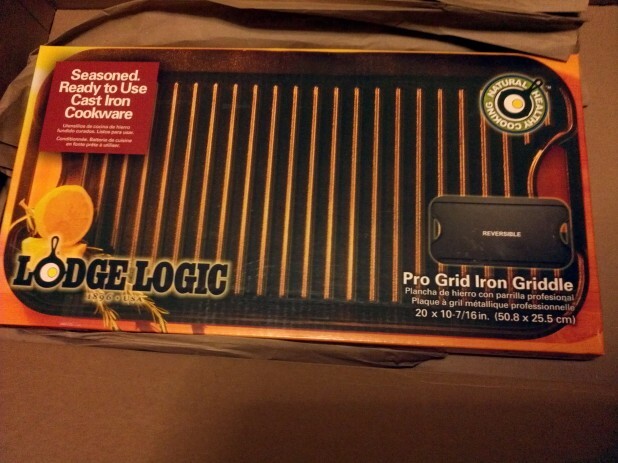 I finally got my Lodge cast iron griddle in from Amazon. For some reason, the bacon I’ve been buying from BJ’s is really long. As a result, when I cook it in my regular 12″ skillet, I can only fit so many pieces and they end up curling. 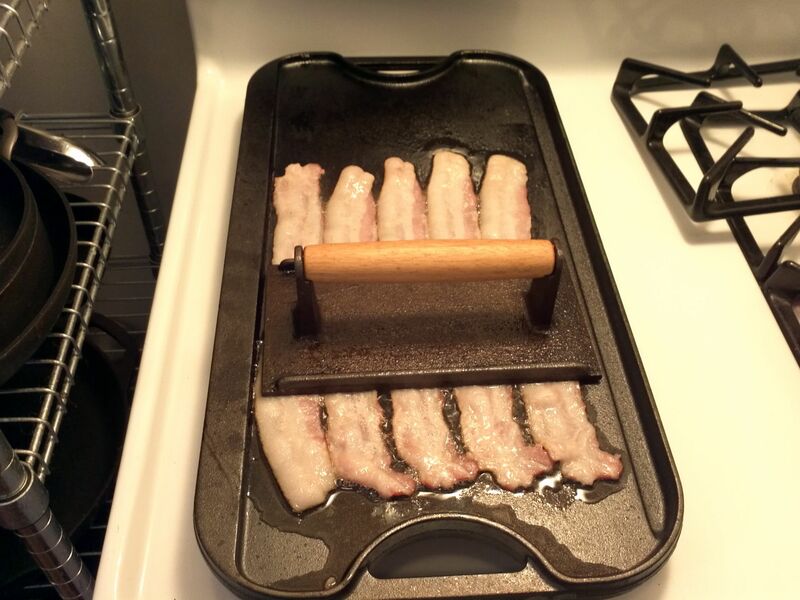 Additionally, its a lot harder to use a bacon press for perfect, flat bacon because the pan is round. 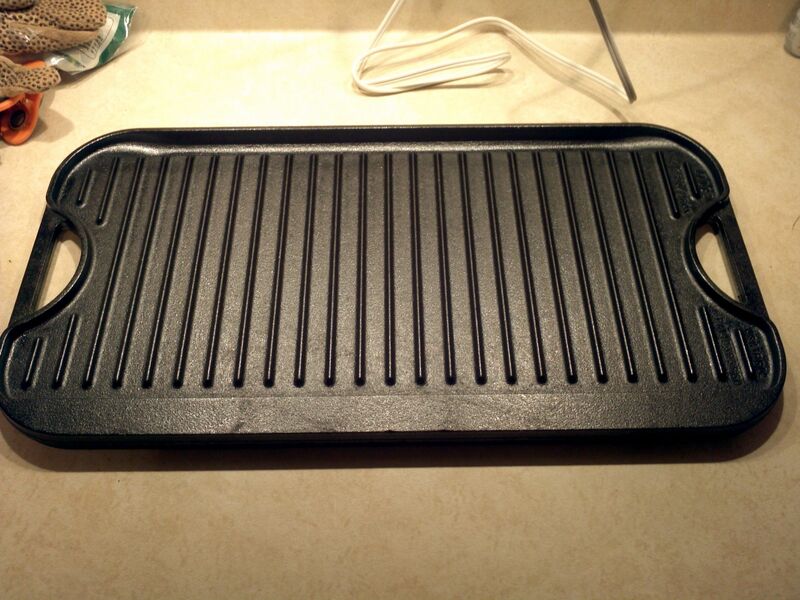 So, I got a griddle! 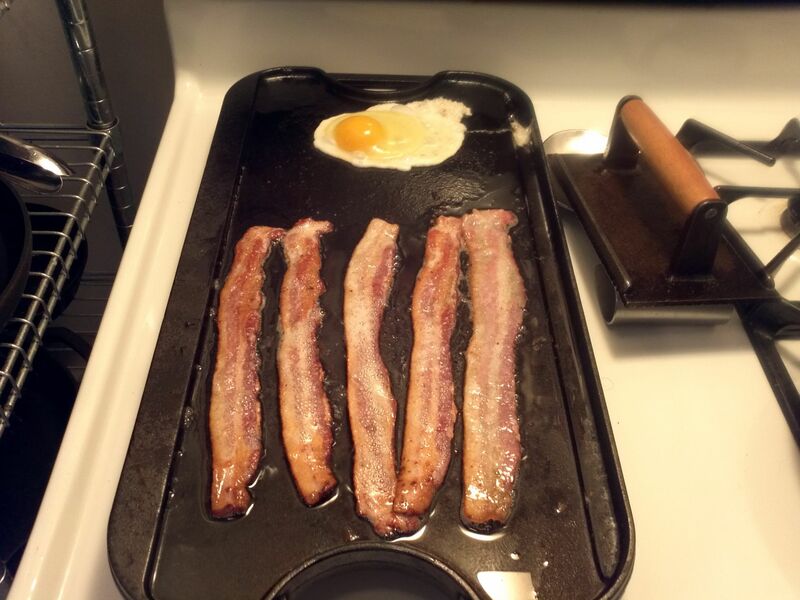 Here is the griddle in use with breakfast cooking away! 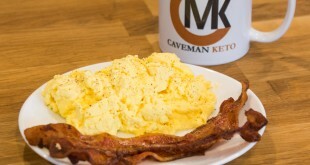 One major advantage is I can cook the eggs and the bacon at the same time. Also, as you can see there is plenty of room for the bacon. 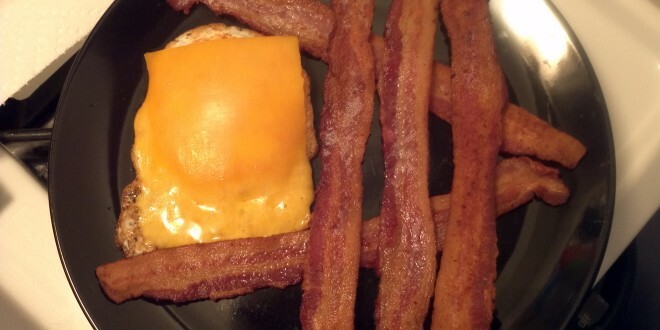 Here is my bacon press holding down the fort. I just place it over the part that is curling. Additionally, you can place the bacon press on the griddle at the upper end to keep it warm. 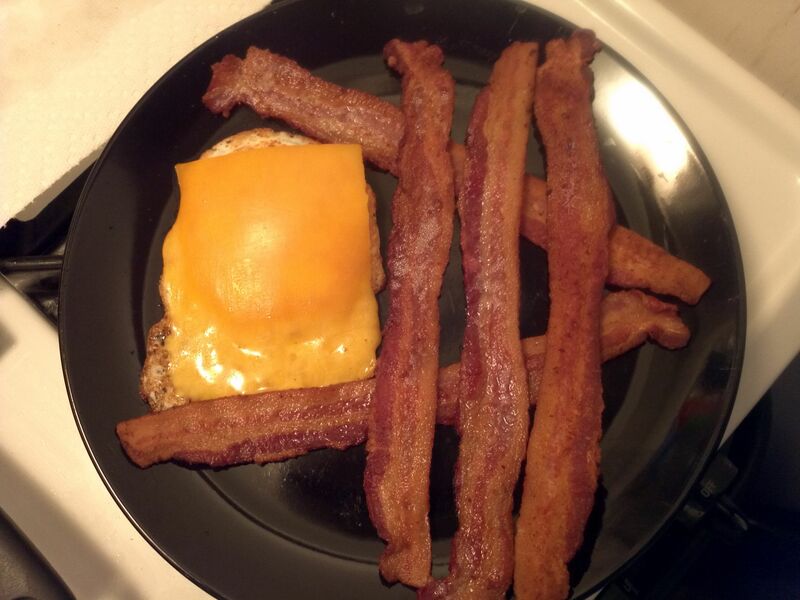 Once I was most of the way done with the bacon, I started frying the egg. The bacon grease is already on the griddle and you can prepare a ton of food on this thing! Finished griddle breakfast! The bacon is really straight and perfect! It comes well packed from Amazon. Here is the flat side. It has a large drip area on the right side and the face is sloped in that direction. It comes preseasoned but the bacon was sticking a little for the first round, I’ll have to run a bunch of bacon over it to get a good coat on there. 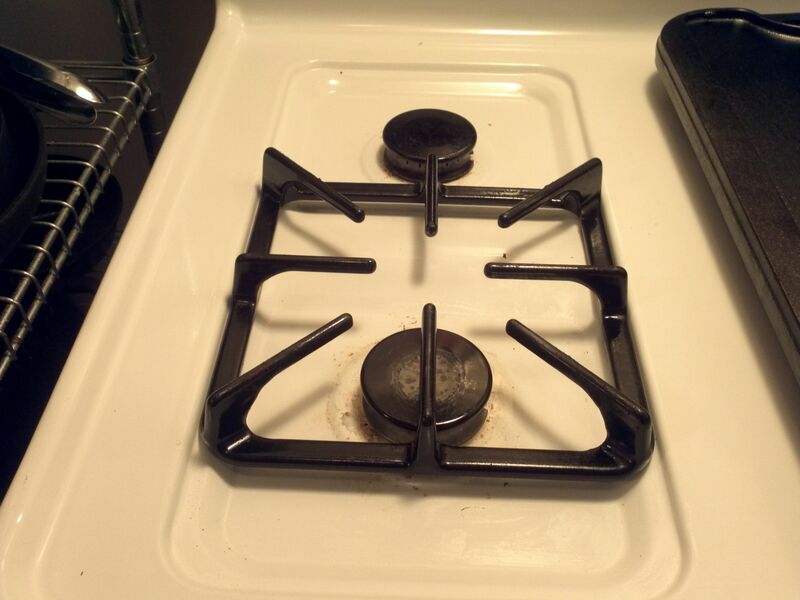 The other side is a grill pattern. I’m excited to try this with steaks and burgers for indoor grill marking! 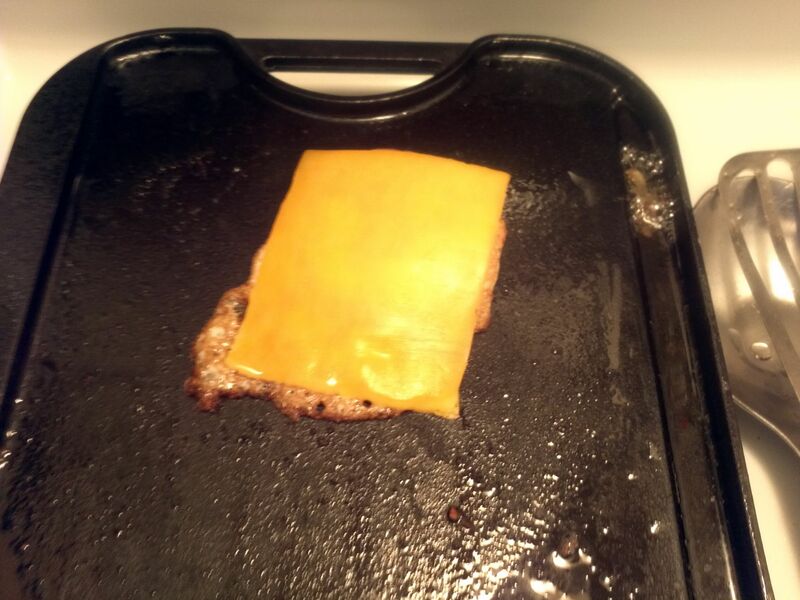 One thing I was really concerned about is the griddle tilt. 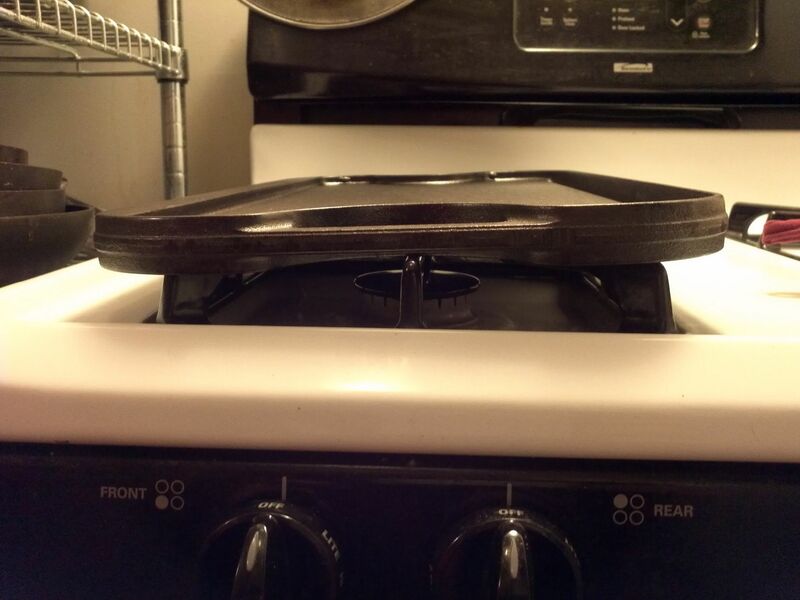 This griddle gets amazing reviews on Amazon except for people with 8 point burners. Their is a video showing how bad it is and they appear to use my exact same oven! Now, being an engineer I was not too concerned, I figured I could fix it no matter what. Above is what they are talking about, the middle point of the burner hits the handle. However, this is really just fear mongering. All I had to do is slide it either forward a little or back a little and the handle falls into place. So either they didn’t try too hard or the device has been reworked. This does distribute the flame a little bit less to the back but it still works great. 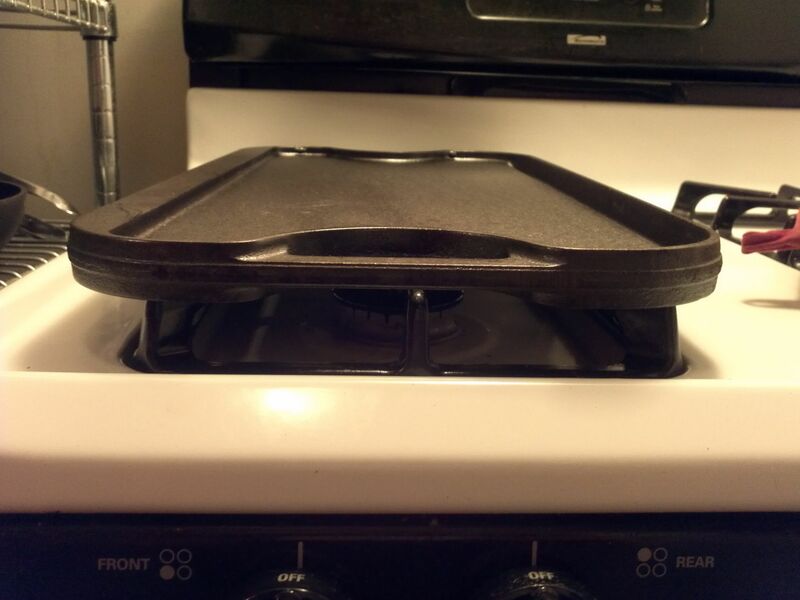 There is also a second option I came up with of removing the second burner cover and sliding the remaining cover more towards the center. The griddle is so big and heavy that it easily rests on one of these. If the other solution doesn’t give you enough flexibility, than this will allow you to center the griddle over both burners. Originally I was going to break out an angle grinder or build up some steel holders to keep the griddle in place but none of that was necessary, I believe this griddle will work with all ovens, unlike the spurious reviews on Amazon.